Joseph Bellows Gallery is pleased to present CHARLES GROGG: Reconstructions, on view from August 13 – November 5, 2010. The reception will be held on Friday, October 1, 2010. Charles Grogg photographs botanicals and other natural imagery isolated from their natural environments. Taken out of their environmental context and in many cases enlarged on paper beyond their usual size, the botanicals offer themselves up for further study and investigation, allowing the delicacy, grace, and inherent sensual details of the flowers and specimens to become forefront. The finished prints of these images are beautiful artifacts themselves. Each image is divided into nine sections, which are individually exposed and developed, then sewn together with cotton thread to reconstruct the original, complete image. 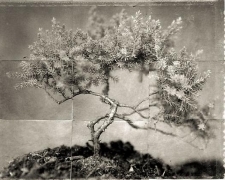 The prints are hand-coated platinum/palladium prints on a luxurious on handmade Japanese gampi paper. This process lends a sensual hand-made and tactile quality to Grogg's already romantic images.